"A lifetime's worth of workbench philosophy in a heartfelt memoir about the connection between a father and son" (Kirkus Reviews)—the acclaimed author of The Hard Way on Purpose confronts mortality, survives loss, and finds resilience through an unusual woodworking project—constructing, with his father, his own coffin. David Giffels grew up fascinated by his father's dusty, tool-strewn workshop and the countless creations it inspired. So when he enlisted his eighty-one-year-old dad to help him build his own casket, he thought of it mostly as an opportunity to sharpen his woodworking skills and to spend time together. But the unexpected deaths of his mother and, a year later, his best friend, coupled with the dawning realization that his father wouldn't be around forever for such offbeat adventures—and neither would he—led to a harsh confrontation with mortality and loss. Over the course of several seasons, Giffels returned to his father's barn in rural Ohio, a place cluttered with heirloom tools, exotic wood scraps, and long memory, to continue a pursuit that grew into a meditation on grief and optimism, a quest for enlightenment, and a way to cherish time with an aging parent. With wisdom and humor, Giffels grapples with some of the hardest questions we all face as he and his father saw, hammer, and sand their way through a year bowed by loss. 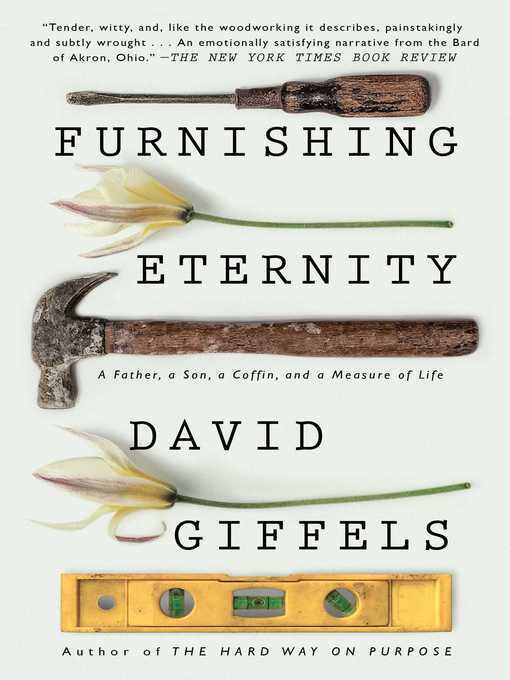 Furnishing Eternity is "an entertaining memoir that moves through gentle absurdism to a poignant meditation on death and what comes before it" (Publishers Weekly). "Tender, witty and, like the woodworking it describes, painstakingly and subtly wrought. Furnishing Eternity continues Giffels's unlikely literary career as the bard of Akron, Ohio...Only a very skilled engineer of a writer can transform the fits and starts, the fitted corners and sudden gouges of the assembly process into a kind of page-turning drama" (The New York Times Book Review).